When a clear, bold statement is the best fit for a Floral, Gift-Wrap, Scrap and Memory Book, or Decorative Craft Idea, Colorco Block Lettering is extremely versatile and perfect for customizing almost anything! Personalization adds Meaning, Beauty, and Value to your finished product or craft and shows that someone took the time to care – specifically! 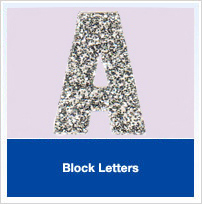 Colorco Block Letters are truly ideal for the creative mind! See our full line by clicking, Our Products, Block Lettering, Product listed in submenu.